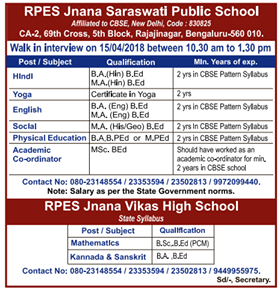 RPES Jnana Saraswati Public School, Bangalore has advertised in DECCAN HERALD newspaper for the recruitment of Teachers jobs vacancies. Interested and eligible job aspirants are requested to appear walk in on 15th April 2018. Check out further more details below. About School: The R.P.E.S. Jnana Vikasa High School is housed in R.P.E.S. PU & First Grade College Campus, 3rd Floor with a group of dedicated competent, qualified and honest teachers. The aim of this school is to provide education with special emphasis for all-round development of students emphasising on discipline and leadership. They trained to fit the practical life in the world of competition.